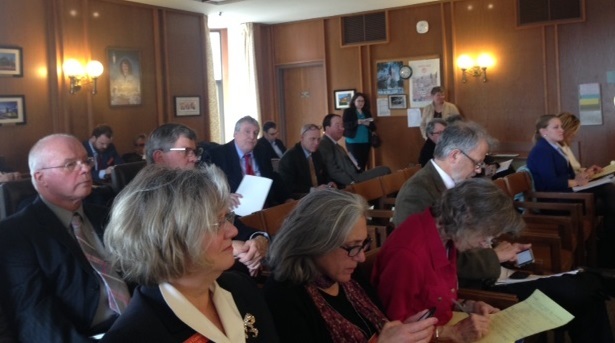 People interested in SB 577 are pictured in a hearing room at the Legislative Office Building in Concord on Wednesday. 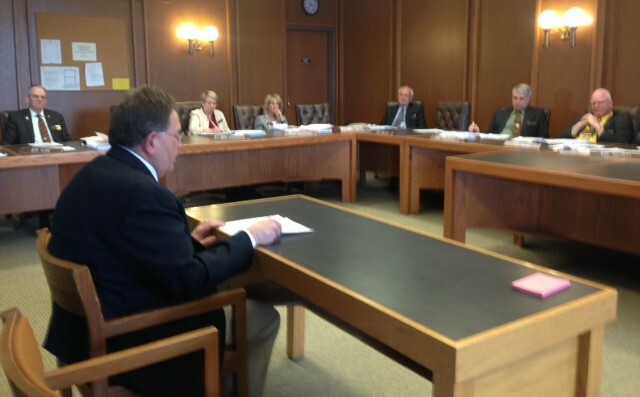 CONCORD – Berlin Mayor Paul Grenier made his case for ongoing subsidies for Burgess BioPower plant on Wednesday testifying in favor of Senate Bill 577 before a House committee. SB 577 would require the PUC to revisit the $100 million cap in a 20-year contract with Eversource Energy that requires the utility to buy some electricity from Burgess BioPower regardless of how much cheaper it would be on the open market. Grenier told the House Science, Energy, and Technology Committee that passing SB 577 is imperative to the city, which will receive $34 million in payments in lieu of taxes over the life of the contract. Payments above prevailing market prices end when they reach $100 million, according to the contract. The PUC approved the contract in 2011 over the objection of consumer advocates who insisted at the time that it would force Eversource customers to pay too much. They argued unsuccessfully that the contract essentially subsidized the logging industry that sells low-grade wood chips to the plant, which is owned by Cate Street Capital Holdings Group. In his testimony before the committee, Grenier said when he was sworn in as mayor in January of 2010, Berlin was teetering on the brink of financial and social ruin. The best and brightest people were leaving and the people who remained were depressed and held little hope the city would survive, he said. Then Burgess BioPower was given the green light. “Suddenly there was this tiny spark,” Grenier testified. Burgess BioPower was the first real economic development success story in Berlin in decades, he said. Berlin Mayor Paul Grenier is pictured testifying before lawmakers in favor of SB 577. Beginning in fiscal year 2019, Burgess BioPower’s tax payment will be about $1.35 million of a $14.5 million warrant, Grenier testified. For Berlin Water Works, Burgess pays $683,000 of a $3.3 million operating budget and represents 15 percent of the total Berlin waste water treatment budget, Grenier said. Last month, the Business and Industry Association announced it’s opposition to SB 577 saying Eversource customers will have already paid $100 million in above-market electricity rates by 2019/2020. “The issue is not about the benefits of renewable energy. It’s about what happens to ratepayers, particularly large energy users who drive New Hampshire’s economy, when utilities are forced to pay for electricity at prices far above market rates and pass those costs onto customers,” said BIA President Jim Roche in a news release. “We should not encourage public policy that artificially inflates costs to ratepayers for the benefit of a single business or region of the state when New Hampshire’s electricity prices are consistently 50-60% higher than the national average,” Roche said. It goes on to instruct the PUC to consider the impact the potential closing or reduced capacity at Burgess BioPower could have on jobs at the plant and in the wood chip industry, property taxes and other impacts on the city of Berlin as well as renewable energy resources in New Hampshire, and the impact on Eversource ratepayers. Sen. Jeb Bradley, R-Wolfeboro, a co-sponsor of the bill, said it will be up to the PUC to decide whether to adjust its original order. “This just asks for that process to happen and then it defines how the public interest should be looked at,” Bradley said. Burgess BioPower could also ask the PUC to revisit its order, he said. “This gives a nudge to the PUC to look at an issue…It doesn’t prejudge what their decision should be,” Bradley said. New Hampshire consumer advocate D. Maurice Kreis, who represents residential ratepayers before the Public Utilities Commission, said he must “reluctantly oppose” SB 577 because it would increase costs to ratepayers. If lawmakers believe it is in the public interest to increase the cap in the Burgess contract, they should make the determination and not send it to the PUC to decide, Kreis said. The Androscoggin Valley Chamber of Commerce sent out an alert to its members asking them to support SB 577. The bill, which has already been voted ought to pass 20 to 4 in the Senate, is co-sponsored by Republicans Sen. Jeb Bradley, Sen. Bob Giuda, Sen. Kevin Avard and Rep. Gene Chandler; and Democrats Sen. Jeff Woodburn, Rep. Robert Theberge and Rep. Yvonne Thomas. Sen. Jeff Woodburn, D-Whitefield, testified Wednesday outlining the history of the forest products industry in the region. “This gives life to a community that needs this extra push,” Woodburn said in support of SB 577. Rep. Edith Tucker, D-Randolph, said Burgess BioPower affects the whole county. Earlier this week, just about everybody in Berlin received a mailing from a group called Advance NH encouraging them to support SB 577. Grenier said he received one. “We have one of the highest tax rates in the state and we’re already losing $220,000 every year in stabilization education grants,” Grenier said. The purchase of wood chips allows loggers to stay in business, he said. “There’s no question if Burgess ceases operations, the city of Berlin is done,” Grenier said. Times are tough again now in Coos County, Grenier said. “When taking the global view of Burgess BioPower economic and social footprint in a part of the state that is desperately lagging behind, I hope you look favorably on SB 577,” Grenier told the committee.